I know to a lot of people Sundays mean the Sunday scaries. For me it’s a great day to get a jump start on the week ahead. I feel like having the attitude of it being a productive day vs worrying about the weekend being over will completely change your perspective. 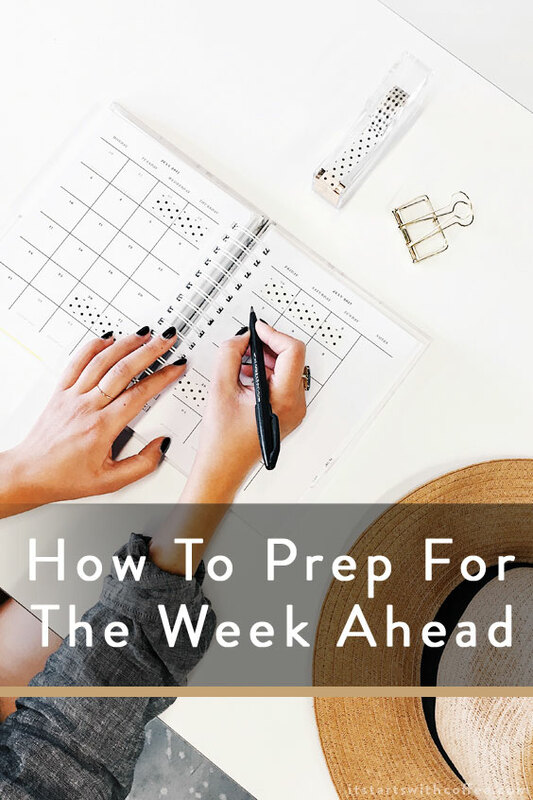 So I want to share my tips for how to prep for the week ahead! Know your calendar: I think one of the biggest mistakes you can make is not looking ahead at the week. Do you have a dentist appt? Does your kiddo have a soccer game? Is there a work dinner? These are things you may have put in your calendar months ago but won’t necessarily be fresh in your mind. On Sundays look over the calendar, the school calendar, your husband’s calendar or if you are like us you have a Google calendar and EVERYTHING is in there and make sure everyone is on the same page. It will save all the headaches on Monday night when you realize everyone has somewhere to be at 5 PM the next day. Meal Plan/Prep: I love a good Sunday meal prep. We do our meal planning Friday nights because we grocery shop on Saturday mornings. So Sundays are meal prep days. Making hard boiled eggs, lots of yummy chicken for salads, sandwiches, egg muffins for breakfast, muffins for snacks, etc. Starting the week with a full fridge and pantry and lots of already made ready to go food is so nice. Make a list: I love making a good Monday to do list. The app I use which is just called “to do list” I can have as many lists as I need so I start one for each day. That way if something comes up I can easily add it to the day it needs to get done and I don’t forget. Do laundry/clean up: I do all of our laundry Sundays and then another load usually Wednesdays. But to me nothing is better than clean clothes, sheets, and towels on Sundays and starting the week off fresh! Literally! Prep everyone: I mean this is different for everyone but I personally prep Liam for the week as much as possible. Getting his school bag ready with diapers and wipes, lunch ready for Monday, clothes laid out, etc. Just easier. Exercise: This doesn’t so much prep you for the week as it does get you in a good mindset and give you endorphins to go into the week in a good mood. But it also may prep you for a really good week of workouts getting a head start Sunday! Have a good attitude: Go into the week with a GOOD attitude. Tell yourself it’s going to be the best week and it will be! What do you do on Sundays to prep for the week ahead? These tips are super helpful 🙂 you can start to organize your week with the easiest thing, but you can see the difference! I am such a planner and I love starting my week with a clean house a full fridge! Thanks for sharing these tips! I’m so on the edge about using calendars. I tried once and failed. I do better with lists though. Prepping is the way to go because the whole week slacks off without a solid plan. Onto some more posts from you now! GREAT advice. I’m trying to do better at this, so thanks for the helpful tips! Great ideas! I always get my planner out on Sundays and make sure I know what’s ahead for the week and we keep a large (cute) chalkboard calender in the kitchen for the family to see. It’s so helpful! I’ve been always having issues planning the week ahead. Month – no problem. Day-to-day? No problem either! But weeks are such a weird time frame for me. On Sunday, I’d rather sit down to prepare for Monday and repeat the process seven times a week. Sundays are when we meal prep too. Get it out of the way so it’s one less thing to think about during the week. Planning for the upcoming week is crucial to be able to let your brain go on autopilot a little bit. It makes for a much more relaxing week! My husband and I sit down together every Sunday evening to go over our calendar for the week, work on the budget and finances, review our meal plan, and go over anything else to make the week ahead easier. Our weeks have been much smoother since we started this routine a few months ago. I do have my written list so I just go through them and see what I have but I love the way you prep. I will try using your tips. Thanks for sharing. Sunday is always a day to create my weekly to do list. I love to plan and the best feeling is when I get to crossed out everything from my list. Planning in advance helps to get a productive week for me. Except meal plan in advance and exercise, rest thing I do follow on every weekend for the coming week 🤗☺ Great tips! I love Mondays… mostly because it means getting back to schedule, as weekends tend to be pretty crazy busy. I do most of these things and they make such a difference. I really have to add regular exercise in. Like, really schedule it the way I do other things. It’s so easy for that to slip by the wayside.